I was born 02 Nov 1890 at Mancos, Montezuma County, Colorado, on a farm called the Seabery place. My parents are William McDonald Devenport and Sarah Jane Barker Devenport. My father was a convert to the Church, being baptized just a few months before he married my mother. Baptized 28 August 1885. Married 14 Dec. 1885. He was the only one of his family who ever joined the Church. (William McDonald Devenport was born 03 December 1864, in Washoe, Washoe County, Nevada, a son of James McDonald Devenport and Mary Hasty Devenport — the 9th of 13 children. [Added to mother’s life story by Marie Dean Speakman]). My mother was born in Devonport, Devonshire, England. When she was a year old her parents, who were recent converts to the L.D.S. Church, came across the sea and, with my mother as a baby crossed the plains. Joseph Barker, the father, driving an ox team for a man, and his wife and child coming three weeks later. Mary Ann (Doidge Barker), the mother, did washing for the captain and his family for the opportunity to let the baby ride, and Mary Ann walked most all of the way. My father was a farmer and had cattle, both range and milk cows, most of the time. He also contracted building fences and tie cutting. We moved from one place to another frequently. Before I was six years old we lived in several places in the Mancos Valley. and at Cortez in Montezuma Valley, and a short time at Telluride, Colorado. My parents taught us to pray and to attend regularly to Sunday worship. They were rather strict in trying to keep our conduct as a Latter-day Saint’s should be. They were anxious that we children should be active and take any office in the Church that we were called to. I had five sisters and one brother. My oldest sister died at the age of seven when I was three years old, but I have little memories of her. Another sister, the next younger than I, died at the age of 16 and left us all to mourn her loss. The next to the youngest child, a tiny baby girl, died at 5 months. So there were three sisters and one brother left. The loss of these children greatly saddened my parents. I had a happy childhood. We had plenty to eat and, by my mother’s skill in sewing for her girls, we were well and comfortably dressed, though money was never very plentiful, and I am sure my parents made great sacrifices to make us happy. We rode in lumber wagons and buggies, and often rode horseback. We had a sidesaddle for the girls, but I would rather ride a man’s saddle. We girls helped our father on the farm, as our brother was the youngest child of the family. We walked at least a mile to get to our school, but we always rode to Sunday School and Church as it was several miles away. From the time I was six to about eleven, we lived at what we called the lake house. It was really a reservoir but a large one and it was within a few yards of our house. Here we swam and skated and most all of the Webber children were baptized there. Many times the thick ice was cut to baptize some of them. I was baptized by John H. Hammond, November 5,1898, in John Hammond’s pond. My friend, Lydia Hammond, was baptized the same day by her father. I was confirmed the next Sunday, November 6th, by Bishop George Halls in the old log meeting house. I started to school a few days before I was six years old. 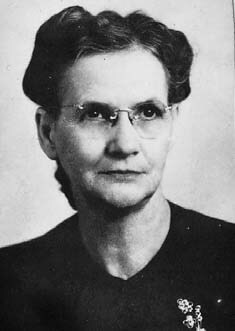 My first teacher was Anna Halls. She was a fine teacher and was also my first Sunday School teacher. My next teacher was Ida Thurber. In the fifth grade I started to Robert Thurber, then to Francis Busch, Miss Ray Provest and Miss Kerr all in elementary school. In high school my first principal was Mr. Sexton where I went to Mancos town to school. I walked in early fall, but in bad weather I rode in a spring buggy with Lydia and Effie Hammond and Lella Halls, and Francis Halls was our driver. I played two years on the basketball girls’ team. I thought I was a pretty good player. I always liked sports and games more than girls’ play at dolls and dishes even when I was younger. When I was 17 we moved to Redmesa, Colorado, which was new sagebrush land open to farming. My father bought 40 acres. Our first year, we rented a farm, and the second year a larger one. This year my sister, Dora, died. It was February and the snow was three feet deep and roads almost impassable. She was the first grave in the Redmesa Cemetery. The next year we built a brick house with six large rooms and a hall. We even had a doorbell, which was very unusual for our country town. We all worked very hard to clear land and plant crops and milk cows. My days were very happy here as there were quite a number of fine young girls and boys who had good times at dances and parties and playing basketball and baseball. We also had plenty of opportunity for church work here. I was a Sunday School teacher and Primary teacher when quite young. In 1912, I became President of the Young Ladies M.I.A. from which I was released in 1914. I taught a class in the religion class organization. Later in 1921 and 1922 I was again made Y.W.M.I.A. President for several years. In later years I taught older classes in Mutual and Sunday School. I was Counselor to Lura Ball in the Primary, Counselor to Agnes Slade in the Relief Society, and Counselor to Florence R. Dean in Primary at different times in Redmesa Ward. In 1911 the San Juan Academy was started in Kirtland, New Mexico. My sister, Bertha, and I lived in a little house and batched and went that year to school, which we enjoyed very much. Charles Edwin Dean and I were married 3rd October 1913, in the Salt Lake Temple. We traveled the most of three days on the train to reach Salt Lake. We went on an excursion rate train and many of our Stake people were on our train. We had to lay over at hotels first night at Telluride and the second night sat in station at Grand Junction, Colorado until 1:00 A.M. then on to our destination by noon the third day. We went to Uncle William Dean’s home to stay the first night before we were married. It was Friday when we were married and Stella Dean and Clara Taylor went through the Temple with me, and Leo Taylor with Charles. Charles mother came from Shelley, Idaho a day or so later. We visited with the grandparents, Joseph Ridges and Agatha Ridges, and some of Charley’s aunts, sisters of his mother. Jasper, Charles oldest brother, was living in Salt Lake working at the time and he showed us around the city and was kind to us. We stayed at the Raymond Hotel for almost a week, then went to Huntsville where my aunt, Ella Halls, lived. She was very good to us and Will Halls asked Charley to stay and work on the farm for a while so we were there two weeks. I gained 10 pounds those two weeks. I needed much more than that as I weighed only 101 pounds before I was married and stayed about that for many years. After leaving Huntsville, we went back to Salt Lake for a few days, then on back to Redmesa on the train. We were gone just a month. The night we got home, we went to a party at the Willdens’ and people seemed glad to see us. For a few days we stayed with my family then moved to Charles’ family home. Strange as it may seem, I had never worried until then where we were going to live, just so we could be together. At his home were two brothers just older than he. The Dean family had moved to Shelley, Idaho just a year before. Lawrence was filing claim on a dry farm at the Mesa and Wilford was in the Redmesa Bishopric, so they had remained. I had also filed on dry farm land, 160 acres, and Charles built the cabin and did the cultivation. We had to live on this place six months out of the year for three years to prove our title. So it was move back and forth to the Redmesa Dean farm and our dry side one. But we were young and it was mostly fun. The snow was very deep some winters. We had a homemade sleigh which we went back and forth in to church gatherings. Charles made some skis and he went about to do errands on them. Our first child was born 5 September 1914. I had a serious childbirth as it was a breach birth and the baby did not breathe for at least 20 minutes. The doctor said, “Perhaps it is best if she does not live as she will surely have dislocated hip joints if she does on account of the difficult time and the pulling on her little legs.” Finally after working vigorously with her, the doctor asked if Sister Taylor, who was a good midwife, had a suggestion. She said, rub alcohol over her heart. Our little baby then began to gasp and soon started to breathe. Even then, the doctor suggested that she be given a name, as he was doubtful that she would survive. Brother Hiram Taylor and my father, William Devenport, blessed her and prayed for her life to be spared. They gave her the name of Mildred. She was again blessed at church a few weeks later. She was a beautiful and perfectly healthy baby and we were indeed grateful that she was spared and is now the mother of seven children of her own. Soon after we were married, my husband was made Superintendent of the Sunday School. Then a little later he was also an alternate High Councilor in the Young Stake (1917). In 1923 he was made Bishop of Redmesa Ward, which position he held for almost nine years. He was then made a High Councilor in the Stake. And in 1935 was made a missionary bishop to an adjoining ward, which was six miles north of us, the Kline Ward. At this time my health was very poor and Apostle Ballard told my husband to bring me to conference the next day at Mancos and he would give me a blessing and that he was sure I would gain my health again. He gave me a wonderful blessing and I was greatly blessed through it as he promised. After almost three years, my husband was released from the Kline Ward as Bishop, and the same day in the afternoon was put back as Bishop of Redmesa Ward. 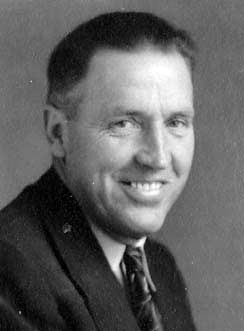 He held that office until we moved to Provo in 1939. Through Charles being Bishop so long, we had many opportunities to meet many of the Church Authorities. Several of them stayed at our home when they came out to Stake Conferences, as they held the conferences in different wards of the stake and there was no hotel in our town to take them, the family must entertain them. This we tried to do the best we could, but embarrassed at our not too fitting accommodations. Before our second child was born, Charles and his brother Lawrence went to a saw mill camp and cut trees and hauled in the logs and had lumber made for each of their families a house. Ours was a small two-roomed, not much more than a cabin. We also bought 40 acres of his mother’s land to farm besides renting her farm and farming our dry farm across the La Plata River. Most years were very dry and we had many near failures of our crops. Some way we seemed to keep happy and lived without wanting for necessary things. Winifred, our second daughter was born 19 January 1917 in our little cabin home. Our regular old doctor was away in the East, so we had to get another for her birth. Charles was away at the sawmill and didn’t arrive until 12 minutes after the baby was born. She was our healthiest and best natured baby we ever had and was a joy to take care of. She now has two boys and two girls of her own. She married Earl Banks of Lehi on the 25th of September, 1942. They live in Albuquerque, New Mexico, where he is a meteorologist with the Weather Bureau of the Government. They were married in the Salt Lake Temple and are very active in the Church organizations. Mildred, our oldest daughter, married Milton Peine, who was a convert to the Church and they were married in the Salt Lake Temple 05 October 1933. Her oldest son is now in the East Canadian Mission, and her second son is ready for college this year. He intends to go to Ft. Lewis College at Durango, Colorado. Her oldest baby died at birth. She now has five fine boys and one sweet girl. Our only son was our third child. He was born 03 March 1919 in the same little house, but we had our old Dr. Smith in attendance. We were all smiles when he told us we had a son. My grandmother and also my mother had six girls before they had one boy. (Note by Marie: Daddy used to tell about Edwin’s birth and how the doctor said, “I think it’s a boy.” and daddy said “Well, you’d better not change your mind now!”) He had dark eyes and hair. The girls were all like their father’s side with grey-green or grey-blue eyes and medium blonde hair. I was glad they had the fair complexion as all of our family had brown eyes and dark hair, and I always longed to be able to wear light blue dresses and couldn’t. We named our son Charles Edwin for his father. He was a beautiful baby with long lashes and fair skin. He was never too husky and had lots of colds and when he was 11 months old he took scarlet fever and had both eardrums break. The ears ran for weeks and he was quite deaf for weeks afterward. After I weaned him, he gained weight better but was subject to colds for some time. At this time we lived in the brick home of Aunt Sally’s. We lived here until Edwin was two years old, then we moved to the old Dean house of Charles’ mother’s which he had moved on to our lower forty. Here we stayed until we moved to Provo. We bought the house and 40 acres of his mother. Edwin, the name we called our son, grew strong and was well and active, though he had several attacks of rheuma­tism and perhaps this caused his heart to be affected as the doctor would not let him participate in active sports in college. After his tonsils were removed, he was much better. All of our children and my husband have lost their tonsils and have been in better health since. Edwin left home to go to his last year high school and has never been at home too much since. He stayed with a couple in Durango then that year. The next year he went to Ft. Lewis College and stayed at the dorm. The next two years he and Winifred all stayed part-time at Ft Lewis and the girls, Mildred and Winifred, both lived one year in a big old house with another two girls and went to Ft. Lewis College. They walked through snowdrifts to their knees and about froze their legs. Winifred went to Ft. Lewis one year and to BYU three years where she graduated. Mildred went the one year at Ft. Lewis then was married at 19. Edwin went three years at Ft. Lewis and got both his B.S. and M.A. 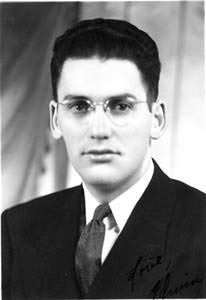 at BYU, and is at the present time, which is Aug. 30 1957, at Ann Arbor, Michigan, about to complete his Doctor’s in Math. Edwin was in the army for two years — eight months spent in Okinawa. He was married to Margaret Peirce 24 December 1943 in Denver, Colorado, where he was in Army Officers School. He met Margaret when they were both in the Western States Mission field. They now have two sons, Bobby and Allan. Our next child is a daughter born 16 May 1923. 1 had very poor health for several years, including a miscarriage in 1922. Our Stake Patriarch gave me a blessing and promised that I would regain my health through the power of the priesthood and my faith, which I did to a great degree, and was blessed with two more children. We named this girl Roberta May. She was a healthy child and always was active in sports and was also a good student. She went to high school at Marvel, a little town iles from home. She graduated from high school at Provo High the next year after we moved to Provo. She continued on to college and graduated in 1947. She was married that September to Paul Robert Peterson. They now have four fine boys. Robert is in the Air Corps Reserves permanently until retirement. At the present they are located at Burlington. Massachusetts, and have bought a home there. He is in the Research and Development Dept. and works in an office at Cambridge, Massachusetts. Our last child, a girl, we named Marie. She was born 13 November 1928 at Durango, Colorado, hospital—our only one born away from home. I had two operations not too long before and we felt very much blessed that I could have this little girl who has been a joy and comfort to us all her life as the other children have also. I nursed her and should not have done so, though the doctor told me to. She gained no weight until I weaned her and gave her goat milk. She gained slowly and was almost a case of rickets before she started doing better and then she became a fine, healthy child and was roly-poly fat until she started to grow taller when she was in the first year of school. Marie was ten years old when we moved to Provo and entered the sixth grade at Joaquin School that year. She attended the Farrer Junior and B.Y High then graduated from BYU in 1951. She and Roberta worked at Sears Roebuck part time to put themselves through college. Edwin and Winifred had helped each other by teaching school. As to my own activities besides my home, I was always active in church work, and held positions in most of the organizations. In a small ward, sometimes I held more than one job at a time. Some of the positions I held: I was secretary of Primary in Mancos Ward when I was about 15 years old. Then after we moved to Redmesa in 1908 after the ward was first organized, I was a Sunday School teacher of a 1st intermediate class for several years. When the Religion Class organization came about, I became a teacher in that and also taught Primary classes at different times. I was Counselor in Primary to two different presidents, and also Counselor in Relief Society organiza­tion three times. The last time was to Sister McNone Perry in the 9th Ward in Provo. In 1912 I was called to be President of Y.W.M.I.A. in Redmesa Ward. I was just there two years when I had to be replaced as I had a tiny baby girl to care for — my first child. I was asked to be President again in 1921 and served two years again. After my children were a little more independent, I took jobs in the Church teaching adult classes in Mutual and also the Gospel Doctrine class in Sunday School for several years. My chief accomplishment when I was younger was singing, and I sang in quartets as well as solos. I always liked to write stories and, since I have had more free time, I have written quite a number of them and had several published in the Relief Society Magazine. I am very interested in genealogy work and have spent almost every minute I could manage to that work for the past two years, and many hours before that time. My daughter, Marie, has been of great assistance in this work. In 1952, Charles and Marie and I went on a trip to Florida to visit our daughter, Roberta, and her family in Tallahas­see, Florida. On our way, we went by Nashville, Tennessee, to do genealogy work and located the County in which my great grandparents on my father’s side had lived and found quite a lot of valuable aid there in our work. Again in 1954, Marie and I went to Franklin County, Tennessee, and several surrounding counties, and then on to Frankfort, Kentucky, to see what more we could find about our ancestors. We found more but not as much as we would like and now seem to be at a standstill on those lines. We have had considerable success on our English lines the past two years. Our 25th Anniversary trip was to Los Angeles and near towns in 1938 in September. 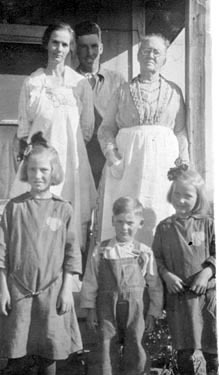 We were away three weeks, and Winifred, our second daughter, who was always a fine help with the children, took most of the responsibility of the children, though she was teaching school and had her hands full. Edwin was going to Ft. Lewis School then and helped do the chores, which were many at the time. We had Verde Halls and his wife stay with them to help out. We had a very fine trip. On our return, we came through St. George and, on our wedding day, we went through the Temple and also attended Sunday services at the ward there. We then went on to Salt Lake to General Conference. Then home to Redmesa, and found that Roberta had been real ill from intestinal flu. We decided to move to Provo that our children might have a better opportunity for college in an L.D.S. city and school. We sold our belongings and moved to Provo in May of 1939. I had written to my Mother and sister that we were going to move.